This book investigates the relationship between liberal democracies and ontology, that is, philosophical claims about the constitution of agents and the social world. Many philosophers argue that ontology needs to be avoided in political and legal philosophy. 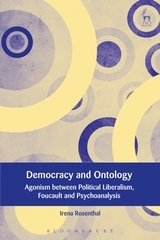 In fact, political liberalism, a highly influential paradigm founded by the philosopher John Rawls, makes the avoidance of ontology a core ambition of its 'political, non-metaphysical' programme. In contrast to political liberalism, this book argues that attending to ontological disputes is essential to political and legal philosophy. Illuminating, criticising and developing ontological arguments does not only enhance our understanding of justice, but also highlights key features of democratic citizenship. The argument is built up by bringing together three traditions of thought that have so far not been confronted with one another: political liberalism, the work of Michel Foucault, and the psychoanalytic theories of Sigmund Freud and Donald Winnicott. The book also investigates more concrete implications of ontological disputes by drawing on several case studies: a Dutch political-legal debate about greeting rituals; an American conflict about the legalisation of religious freedom; and the struggles for resilience of two American social movement groups. Irena Rosenthal is Assistant Professor of Legal Theory at the University of Amsterdam.